Mermaid selfies are about to become a thing thanks to the arrival of a pop-up mermaid museum in in Hollywood. The POPSUGAR x Freeform Mermaid Museum is heading to Goya Studios at the end of March with all sorts of social media-ready installations in tow, including a tank with a live mermaid. 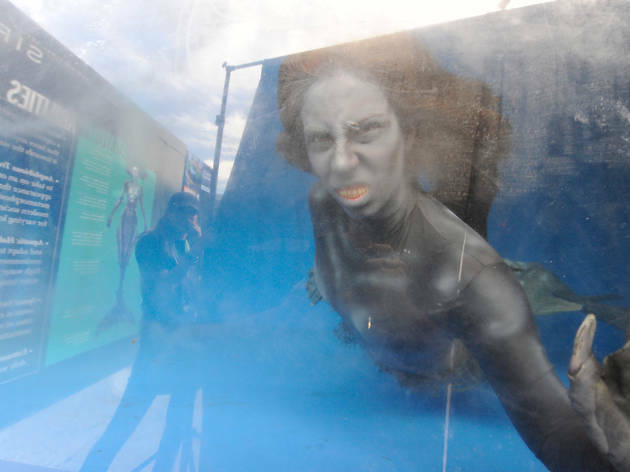 Don’t expect colorful clamshells and Broadway tunes, though; the Mermaid Museum is tied to Freeform’s upcoming series Siren and takes an eerie approach to the mythical feature (see the sort of terrifying photo above). You’ll begin with a walk through the Bristol Cove Mermaid Shop, an artifact-filled shop inspired by the show, and continue on to a photo op that lets you look like a mermaid floating in an underwater garden. The pop-up also includes a room with 360-degree projections of underwater life, an interactive sequin scale wall and the aforementioned mermaid tank. You can swing by the Siren-inspired POPSUGAR x Freeform Mermaid Museum at Goya Studios (1541 N Cahuenga Blvd) On March 22 and 23 from 3 to 9pm and March 24 and 25 from noon to 6pm. Admission is free.